The Ann Arbor, Mich.-based Borders Group filed for Chapter 11 bankruptcy protection on Feb.
16. DJM, a New York-based firm, is tasked with disposing all remaining Borders locations. Representatives for DJM confirmed that interest is high overall but also declined to disclose specific names. According to national reports, Books-A-Million was looking at buying 30 to 35 Borders locations, but the deal fell through. 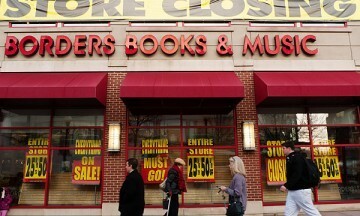 As liquidators work to clear books from its retail shelves, Borders Group Inc. is preparing for a sale that could enable the bookseller's brand to live on even after its stores go dark. Borders executives laid out plans to auction off the company's intellectual property, including the Borders.com website, at a Sept. 14 auction--an event that's expected to attract offers worth millions of dollars. We were away on vacation for a week, so arriving back home to see the huge GOING OUT OF BUSINESS banner on the top floor of Borders in Birmingham took our breath away. Even though we'd heard the rumors before we left — that Borders, our proud, homegrown bookseller — and the nation's second-largest book chain — was going under, we were holding out hope that a last-ditch effort would save a few of the almost 1,200 stores the chain had at its peak.